C-14 TO C-19 PLUG ADAPTER, POWER CORD, 15 AMPERE-250 VOLT, IEC 60320 C-14 PLUG, IEC 60320 C-19 CONNECTOR, 14/3 AWG SJT, 105°C, 2 POLE-3 WIRE GROUNDING, 2.5 METER (8FT.-2IN.) LONG. BLACK. Description: PLUG ADAPTER, DETACHABLE POWER CORD, 15 AMPERE-250 VOLT, IEC 60320 C-14 PLUG, IEC 60320 C-19 CONNECTOR, 14/3 AWG SJT, 105°C, 2 POLE-3 WIRE GROUNDING, 2.5 METER (8FT.-2IN.) LONG. BLACK. 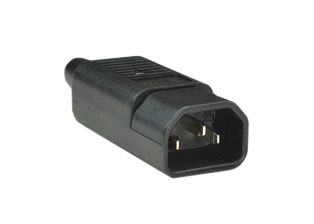 PLUG ADAPTER, DETACHABLE POWER CORD, 15A-250V, IEC 60320 C-14 PLUG, IEC 60320 C-19 CONNECTOR, 14/3 AWG SJTO 105°C, 0.3 METERS (1 FOOT) (12") LONG. BLACK. 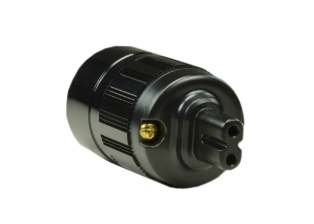 PLUG ADAPTER, DETACHABLE POWER CORD, 15A-250V, IEC 60320 C-14 PLUG, IEC 60320 C-19 CONNECTOR, 14/3 AWG SJT 105°C, 0.46 METERS (1FT.-6IN.) (18") LONG. BLACK. 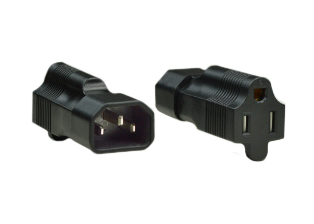 PLUG ADAPTER, DETACHABLE POWER CORD, 15A-250V, IEC 60320 C-14 PLUG, IEC 60320 C-19 CONNECTOR, 14/3 AWG SJT 105°C, 0.76 METERS (2FT.-6IN.) (30") LONG. BLACK. 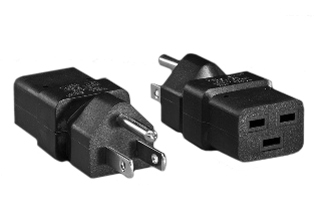 PLUG ADAPTER, DETACHABLE POWER CORD, 15A-250V, IEC 60320 C-14 PLUG, IEC 60320 C-19 CONNECTOR, 14/3 AWG SJT 105°C, 0.3 METERS (1 FOOT) (12") LONG. BLACK. 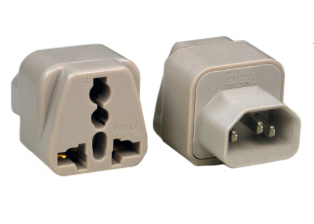 PLUG ADAPTER, DETACHABLE POWER CORD, 15A-250V, IEC 60320 C-14 PLUG, IEC 60320 C-19 CONNECTOR, 14/3 AWG SJT 105°C, 0.6 METERS (2 FEET) (24") LONG. BLACK. 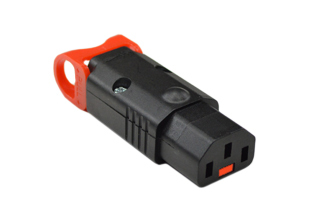 PLUG ADAPTER, DETACHABLE POWER CORD, 15A-250V, IEC 60320 C-14 PLUG, IEC 60320 C-19 CONNECTOR, 14/3 AWG SJT 105°C, 0.9 METERS (3 FEET) (36") LONG. BLACK. 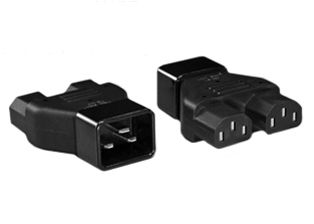 PLUG ADAPTER, DETACHABLE POWER CORD, 15A-250V, IEC 60320 C-14 PLUG, IEC 60320 C-19 CONNECTOR, 14/3 AWG SJT 105°C, 1.2 METERS (4 FEET) (48") LONG. BLACK. PLUG ADAPTER, DETACHABLE POWER CORD, 15A-250V, IEC 60320 C-14 PLUG, IEC 60320 C-19 CONNECTOR, 14/3 AWG SJT 105°C, 1.5 METERS (5 FEET) (60") LONG. BLACK. 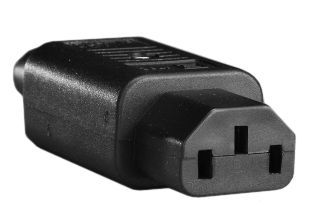 PLUG ADAPTER, DETACHABLE POWER CORD, 15A-250V, IEC 60320 C-14 PLUG, IEC 60320 C-19 CONNECTOR, 14/3 AWG SJT 105°C, 1.8 METERS (6 FEET) (72") LONG. BLACK. 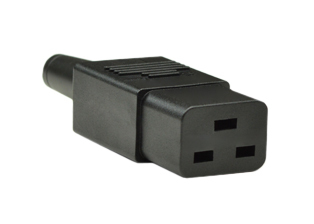 PLUG ADAPTER, DETACHABLE POWER CORD, 15A-250V, IEC 60320 C-14 PLUG, IEC 60320 C-19 CONNECTOR, 14/3 AWG SJT 105°C, 2.1 METERS (7 FEET) (84") LONG. BLACK. 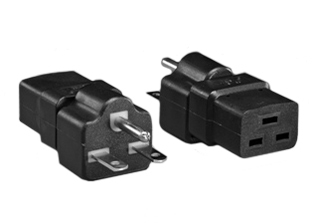 PLUG ADAPTER, DETACHABLE POWER CORD, 15A-250V, IEC 60320 C-14 PLUG, IEC 60320 C-19 CONNECTOR, 14/3 AWG SJTO 105°C, 2.44 METERS (8 FEET) (96") LONG. BLACK. 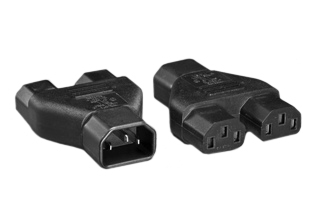 PLUG ADAPTER, DETACHABLE POWER CORD, 15A-250V, IEC 60320 C-14 PLUG, IEC 60320 C-19 CONNECTOR, 14/3 AWG SJTO 105°C, 3.05 METERS (10 FEET) (120") LONG. BLACK. PLUG ADAPTER, DETACHABLE POWER CORD, 15A-250V, IEC 60320 C-14 PLUG, IEC 60320 C-19 CONNECTOR, 14/3 AWG SJT 105°C, 4.6 METERS (15 FEET) (180") LONG. BLACK. PLUG ADAPTER, DETACHABLE POWER CORD, 15A-250V, IEC 60320 C-14 PLUG, IEC 60320 C-19 CONNECTOR, 14/3 AWG SJT 105°C, 1.0 METERS (3FT.-3IN.) (39") LONG. BLACK. PLUG ADAPTER, DETACHABLE POWER CORD, 15A-250V, IEC 60320 C-14 PLUG, IEC 60320 C-19 CONNECTOR, 14/3 AWG SJT 105°C, 1.5 METERS (4FT.-11IN.) (59") LONG. BLACK. PLUG ADAPTER, DETACHABLE POWER CORD, 15A-250V, IEC 60320 C-14 PLUG, IEC 60320 C-19 CONNECTOR, 14/3 AWG SJT 105°C, 2.0 METERS (6FT.-7IN.) (79") LONG. BLACK. PLUG ADAPTER, DETACHABLE POWER CORD, 15A-250V, IEC 60320 C-14 PLUG, IEC 60320 C-19 CONNECTOR, 14/3 AWG SJT 105°C, 3.1 METERS (10FT.-2IN.) (122") LONG. BLACK. 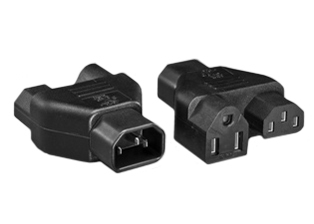 UNIVERSAL (UL, CSA, VDE) APPROVALS ) "Y" TYPE SPLITTER POWER CORD, 10A-250V, IEC 60320 C-14 PLUG, TWO C-13 CONNECTORS, 17/3 AWG, SJTO, 105°C, 2.5 METERS (8FT.-2IN.) (98") LONG. BLACK. UNIVERSAL "Y" TYPE SPLITTER POWER CORD, 10A-250V, IEC 60320 C-14 PLUG, TWO C-13 CONNECTORS, 17/3 AWG, SJTO, 105°C, 0.46 METERS (1FT.-6IN.) (18") LONG. BLACK. UNIVERSAL (UL, CSA, VDE APPROVALS ) "Y" TYPE SPLITTER POWER CORD, 10A-250V, IEC 60320 C-14 PLUG, TWO C-13 CONNECTORS, 17/3 AWG, SJTOW, 105°C, 1.8 METERS (6 FEET) (72") LONG. BLACK. 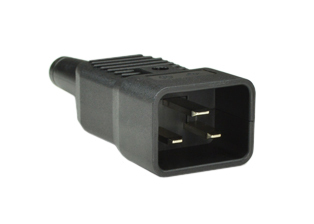 15A-250V POWER CORD, IEC 60320 C-14 PLUG, IEC 60320 C-15 CONNECTOR, 14/3 AWG SJT, 105°C, (UL,CSA LISTED), 0.38 METERS (1FT.-3IN.) (15") LONG. BLACK. 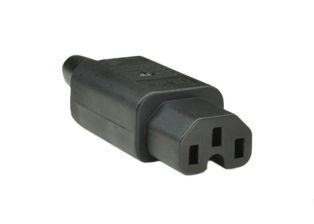 15A-250V POWER CORD, IEC 60320 C-14 PLUG, IEC 60320 C-15 CONNECTOR, 14/3 AWG SJT, 105°C, (UL,CSA LISTED), 27 INCHES 0.69 METERS (2FT.-3IN.) (27") LONG. BLACK. 15A-250V POWER CORD, IEC 60320 C-14 PLUG, IEC 60320 C-15 CONNECTOR, 14/3 AWG SJT, 105°C, (UL,CSA LISTED), 0.6 METERS (2 FEET) (24") LONG. BLACK. 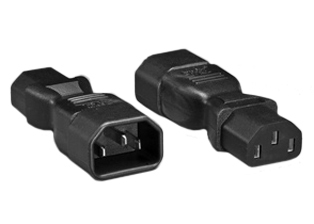 15A-250V POWER CORD, IEC 60320 C-14 PLUG, IEC 60320 C-15 CONNECTOR, 14/3 AWG SJT, 105°C, (UL,CSA LISTED), 0.9 METERS (3 FEET) (36") LONG. BLACK. 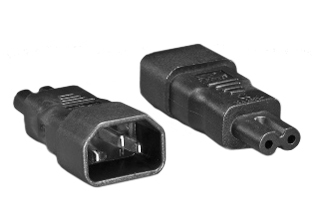 15A-250V POWER CORD, IEC 60320 C-14 PLUG, IEC 60320 C-15 CONNECTOR, 14/3 AWG SJT, 105°C, (UL,CSA LISTED),1.2 METERS (4 FEET) (48") LONG. BLACK. 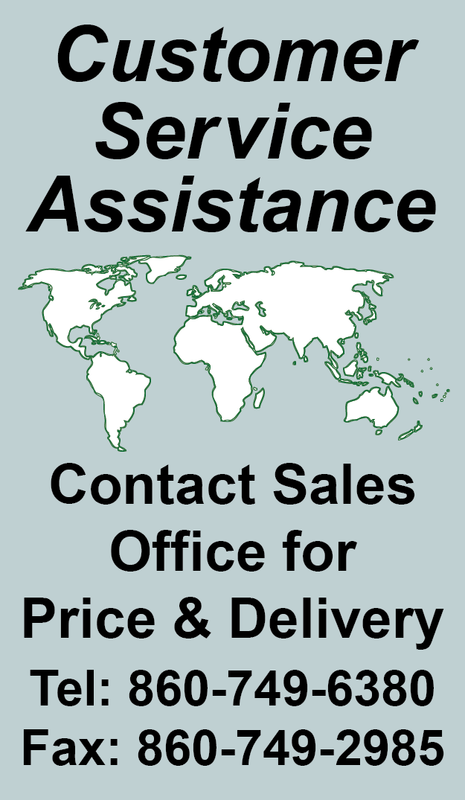 15A-250V POWER CORD, IEC 60320 C-14 PLUG, IEC 60320 C-15 CONNECTOR, 14/3 AWG SJT, 105°C, (UL,CSA LISTED),1.8 METERS (6 FEET) (72") LONG. BLACK. 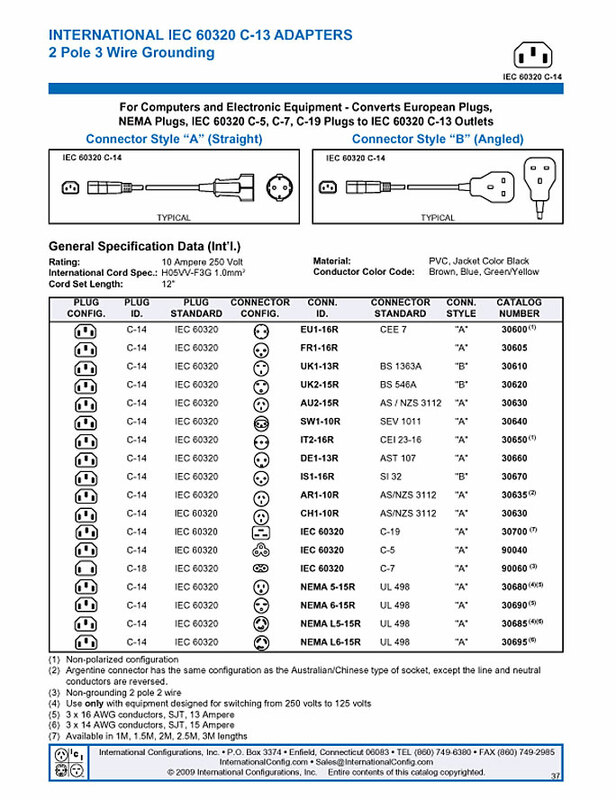 15A-250V POWER CORD, IEC 60320 C-14 PLUG, IEC 60320 C-15 CONNECTOR, 14/3 AWG SJT, 105°C, (UL,CSA LISTED), 2.44 METERS (8 FEET) (96") LONG. BLACK. 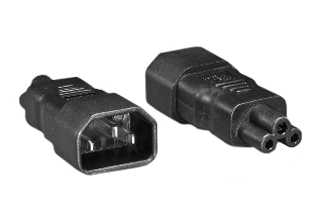 15A-250V POWER CORD, IEC 60320 C-14 PLUG, IEC 60320 C-15 CONNECTOR, 14/3 AWG SJT, 105°C, (UL,CSA LISTED), 3.05 METERS (10 FEET) (120") LONG. BLACK. 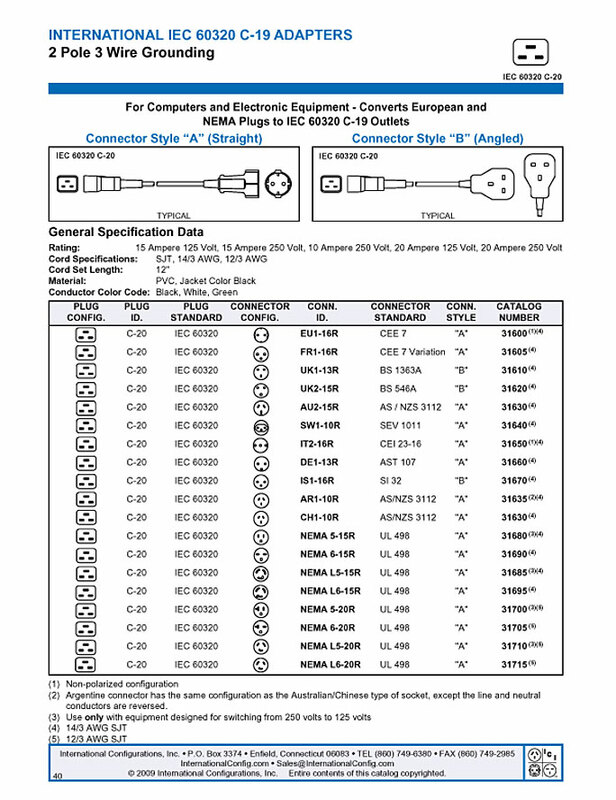 15A-250V POWER CORD, IEC 60320 C-14 PLUG, IEC 60320 C-15 CONNECTOR, 14/3 AWG SJT, 105°C, (UL,CSA LISTED), 4.6 METERS (15 FEET) (180") LONG. BLACK.